The same type of bomb-carrying robot that Dallas police used to kill a sniper who shot and killed five officers during a Black Lives Matter rally could easily be fashioned and deployed by dozens of other police forces across the country.The robot that officers used to kill Micah Xavier Johnson is designed to find and disarm bombs, not deliver them. 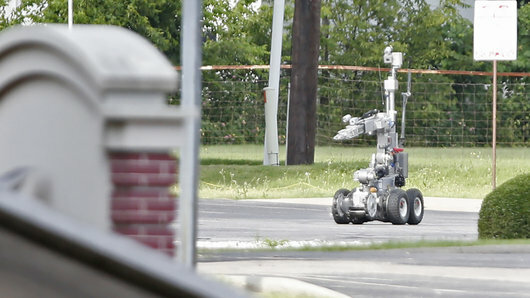 But after a standoff Thursday night, police outfitted the robot with an explosive device and detonated it near Johnson. Robotics experts said the incident was the first time law enforcement has used a robot in a targeted killing in the U.S.